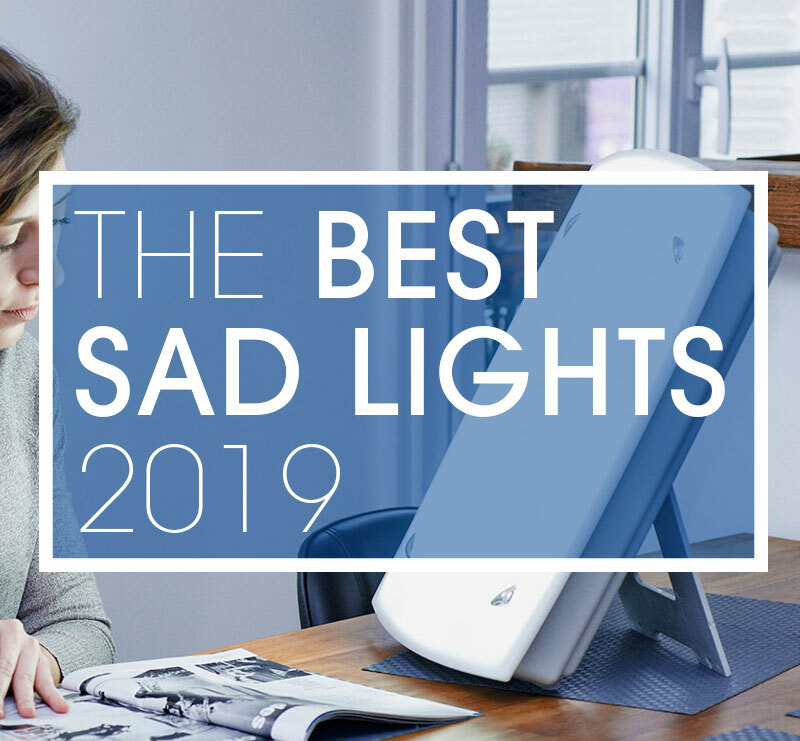 This top priced device is designed purely for providing a large output of light that is suitable for treating SAD at a large distance. 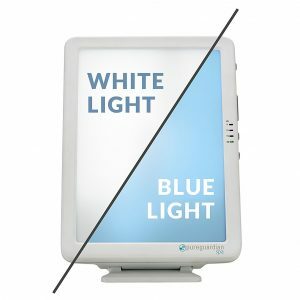 It may not be as pretty as others or contain any additional features but the light it produces is brilliant and allows you to be up to 24 inches away from it while receiving your treatment. 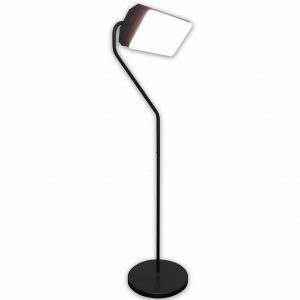 Although sold and branded by an American company the light is actually made in China so if you have a loyalty to products made in the United States this lamp will not be for you. 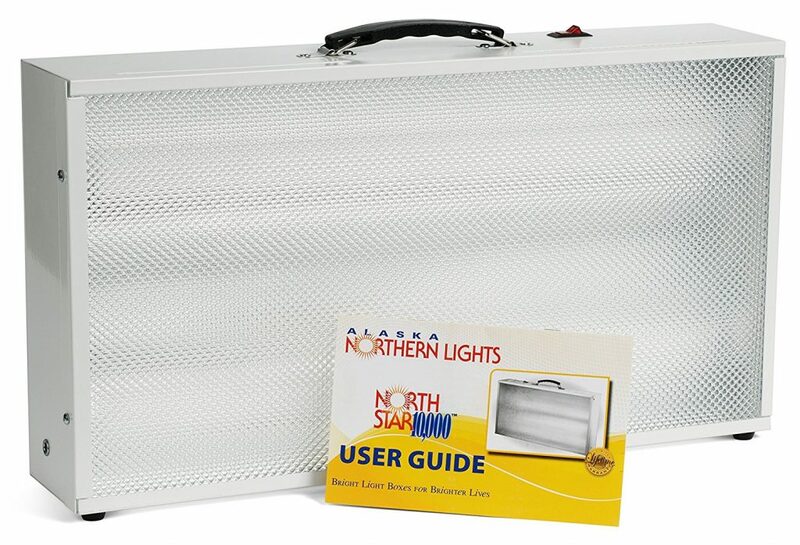 With over 100 reviews on Amazon.com rated at an average of 4.7 stars, this is a trusted light with a good reputation and great feedback. We recommend this only if you have serious SAD symptoms and need a light to use from a greater distance. There are newer, smaller, lighter and cheaper units now available. 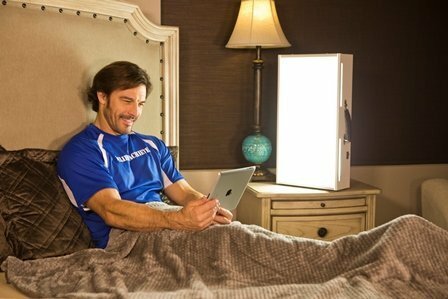 10,000 LUX – Brightest full spectrum therapy light on the market. 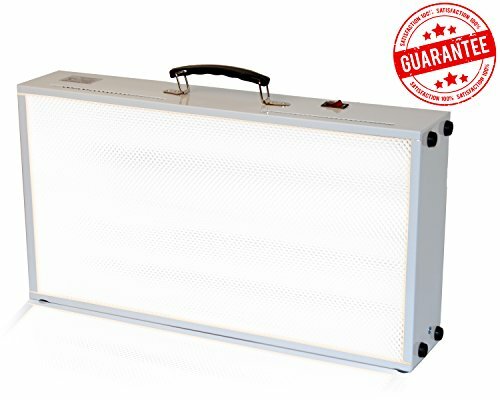 Safe and efficient, UV free bulbs mimic natural daylight – maximum results at a comfortable distance. *Beware of cheap low-quality imitations that offer ineffective results. 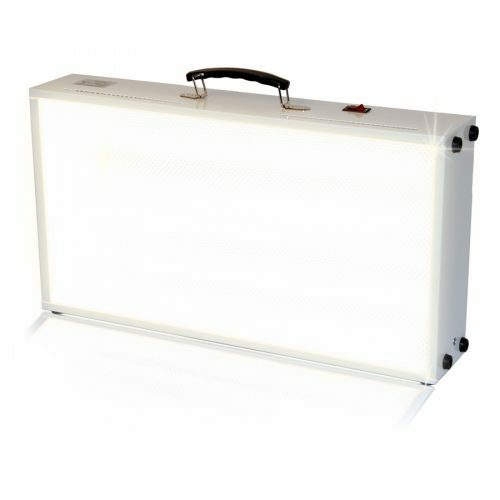 LIGHT SENSITIVITY – A fluorescent option for those sensitive to LED lights; this works wonderfully with a lifespan of 3-4 years before needing a replacement. The North Star 10,000 certainly doesn’t try and be flashy. It is a simple design that functions well. It is housed in a metal with a prismatic diffuser on the font. While not all that aesthetically pleasing there is something about the simple design that inspires confidence. 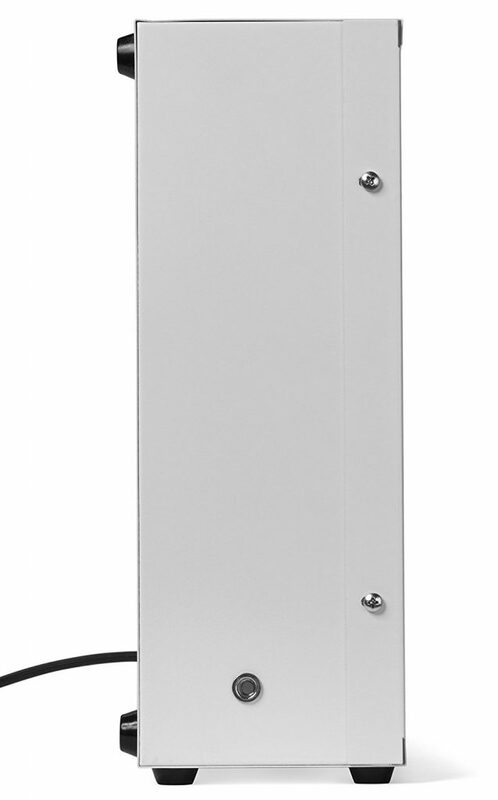 It comes with a carry handle along one side, the same side that the on-off switch is located along with an air vent. Inside are 2 x 55w compact fluorescent bulbs and a metal reflector to help push the light out. There are rubber feet in the corners along both the long edge and one of the narrower edges to allow standing horizontally or vertically. The unit feels well built and the size helps it feel sturdy whichever way you position it. It is definitely one of the larger lights we have seen and weighs in at 10 pounds so is not considered portable. The bulbs do not come pre-installed which is something you have to do yourself. There are simple instructions included in how to do this. The clips that hold the bulbs were slightly fiddly and I wasn’t sure how much pressure to apply to lock them into place. This light is class leading when it comes to the distance you can be from it to get the full 10,000 Lux. At 24 inches away there is only a couple of others light that comes close and this is narrower than its competitors allowing you the option to set it up in numerous place. The light that is produced is a broad spectrum as opposed to many manufactures broad spectrum bulbs. The light produced from the two 55 watt compact fluorescent bulbs is quite astonishing and it just pours out of the box. There was no noise from the ballast and the light was flicker free. The on-off switch was easy to use and felt solid. It uses 140 watts which isn’t too bad considering the brightness of these bulbs. This does not have any fancy features to note. We will comment on the fact that you can buy a stand and carry bag for this as an optional extra. 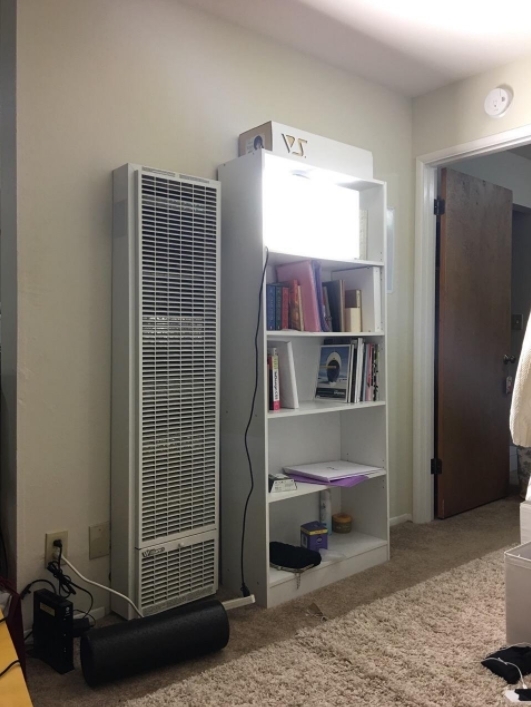 This costs $80 more which doesn’t seem like good value but it must be noted that you may need it to raise the lamp higher should you not have a suitable place to put it. 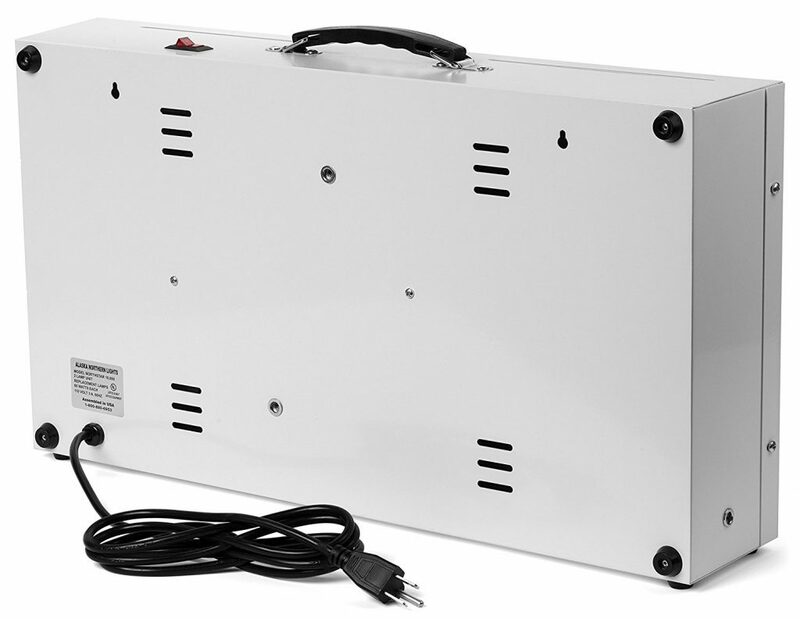 It is rated as 120v AC. 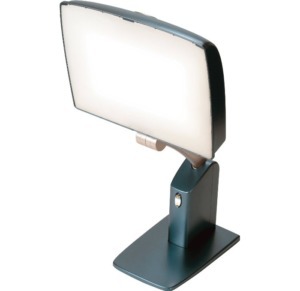 This light sells for a rather high $299.77 including shipping. To us, this seems expensive but the company does include a lifetime warranty with the product and it is a comparable price to other units of this strength.